Features informed discussion on the reconciliation process in Sri Lanka, with a strong emphasis on the protection and promotion of rights. 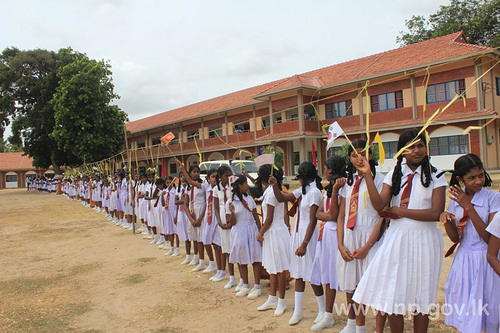 Two newly built classroom complexes of Kilinochchi Konavil Government Tamil Mixed School were declared open on 28th July 2014. . Ambassador of the Republic of Korea for Sri Lanka Chang Won-sang and Minister of Education Bandula Gunawardana participated as chief guests and declared open the building. Minister of Traditional Industries and Small Enterprise Development Douglas Devananda, Governor of the Northern Province GA Chandrasiri and Parliamentarian M.Chandrakumar also graced the occasion as special guests. A two storied building which comprises a science and a computer laboratories and a single storied building which comprises 4 classrooms and a library were declared open. 52 million were spent for the construction of these buildings with the financial donation of Korean Republic. Principal of the School K.Ithayasivathas chaired the program. Provincial Secretary of Education Ministry S.Sathiyaseelan, Kilinochchi Zonal Director K.Murugavel and large number of students also took part at this event.